Slate contributor Edward McClelland was online Wednesday, Dec. 31 at 11 a.m. ET to discuss his take on embattled Illinois Gov. 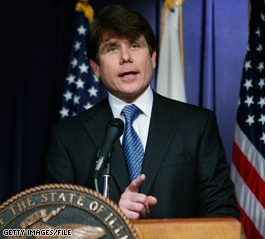 Rod Blagojevich’s decision to name former Illinois Atty. Gen. Roland Burris to replace President-elect Barack Obama in the U.S. Senate, despite federal charges stating Blagojevich tried to auction off the seat to the highest bidder. The President-elect’s chief of staff, Rahm Emanuel, said today he won’t go to the Chicago Presidential transition offices in order to avoid reporters seeking to ask him whether he had contact with Illinois Governor Rod Blagojevich about the Senate seat vacated by Barack Obama’s election. Emanuel appeared “beet-red,” according to an ABC News cameraman who was invited inside by Emmanuel to use his bathroom this morning. “I’m getting regular death threats. You’ve put my home address on national television. I’m pissed at the networks. You’ve intruded too much, “ Emanuel said, according to the cameraman. A spokesman for Emanuel says he later showed up at the office, apparently able to sneak out of the house without being seen by reporters waiting to askhim questions. • Impact on 2016 Olympic bid: Will the scandal hurt Chicago? ABC: Jackson is ‘Candidate 5’ Politico – Wed Dec 10ABC News has a law enforcement source telling them that Jesse Jackson, Jr. is “Senate Candidate Five,” the one who was — according to Blagojevich — willing to supply campaign cash in exchange for the Senate seat. Analysis: Scandal threatens to dog Obama AP – Wed Dec 10WASHINGTON – President-elect Barack Obama hasn’t even stepped into office and already a scandal — not of his own making — is threatening to dog him. Obama hopes to reboot US image among Muslims AP WASHINGTON – President-elect Barack Obama says he will try to “reboot America’s image” among the world’s Muslims and will follow tradition by using his entire name — Barack Hussein Obama — in his swearing-in ceremony.